The desktop PCs were not dead, they were having a binge. This is at least what MSI demonstrates with a renewed catalog of equipment that comes with better specifications and a singular commitment to the Intel Optane storage and storage units. That prominence of these storage systems is shared with the new 8th generation Intel processors : from the modest Core i3-8100 to the powerful Core i7-8700K perfect for gamers and even models of the Core X family, the offer is the most complete. 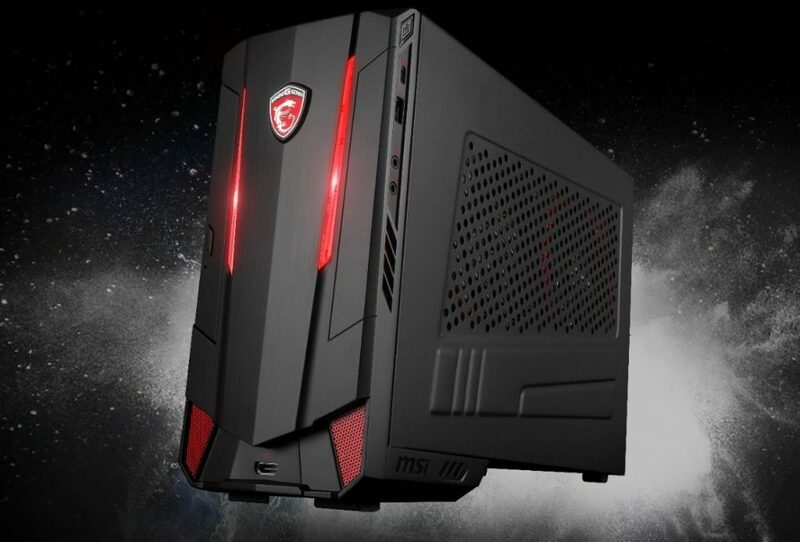 In MSI they have renewed that line of compact desktop PCs aimed at gaming that began in 2014 with their Nightblade and extended with the Aegis family or the ultra-compact Trident. Precisely the novelties attack all those ranges of product, from the compact NightBlade MIB, NightBlade MI3 and NightBlade 3 to the ultra-compact Trident 3. 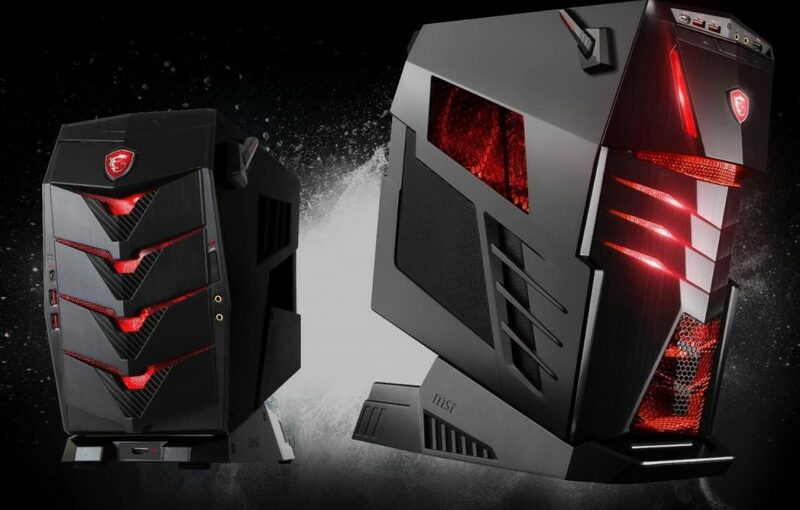 However, the most striking are probably the Aegis X3 and Aegis TI3, with box designs of 19 and 39 liters of volume that are comparatively much more compact than the standard medium size towers (about 40 liters) and the complete ATX (60 liters approximately). 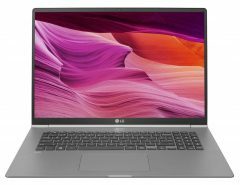 The specifications of these equipment vary according to each family, but in all of them there are two clear universal bets: the first one, that of the 8th generation Intel Core processors; the second, that of the Intel Optane units. In that second bet we find ourselves in two different ways. 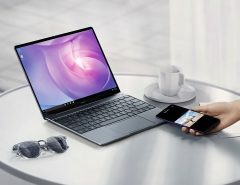 One is that of Optane memory with somewhat more limited capabilities, those first Optane family solutions that work in collaboration with a traditional hard drive and that focus on accelerating the operation of these PCs by making those small units serve almost as a “cache”for the data that is accessed most frequently. The other side is much more ambitious, as it is the new Intel SSD 900P units reserved in this case to gaming and with really promising performances if we take into account the Intel data and the MSI itself: up to 2500 MB / s in sequential reading, which of course gives a lot of room for maneuver for users of these teams. 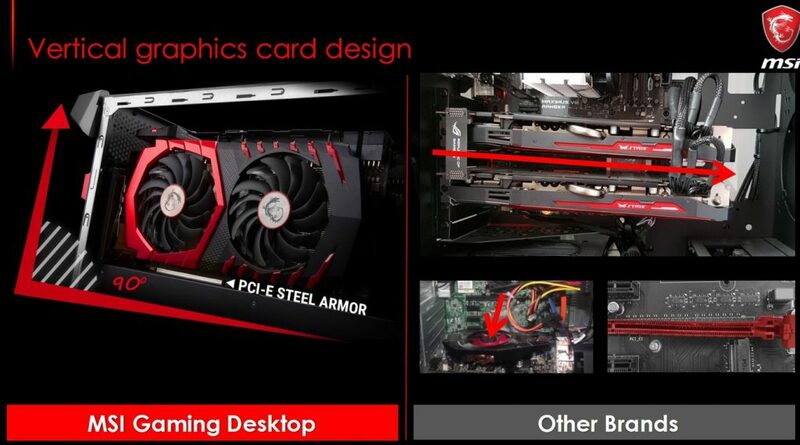 The teams also have different versions of MSI graphics based on GPUs from the NVIDIA GTX family that also have a vertical positioning system instead of the traditional horizontal placement, something that in MSI indicates that it improves the control of the temperature of these components. 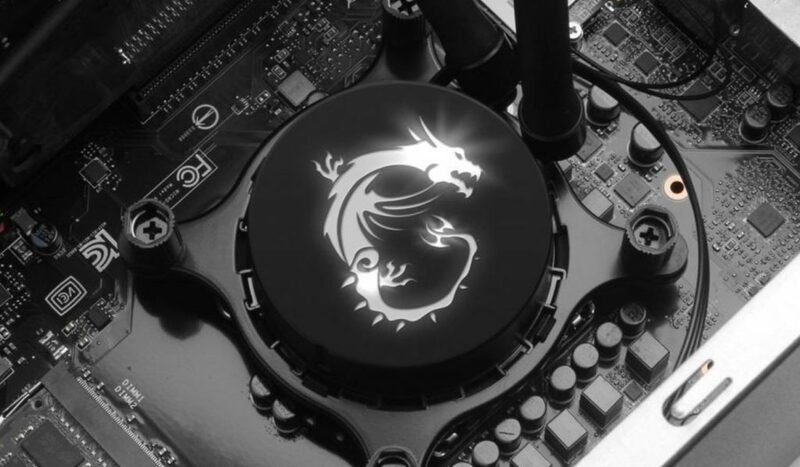 In several of the models we have a special overclocking system that makes that with the press of the front button present in these towers the performance becomes 15% normal according to MSI. 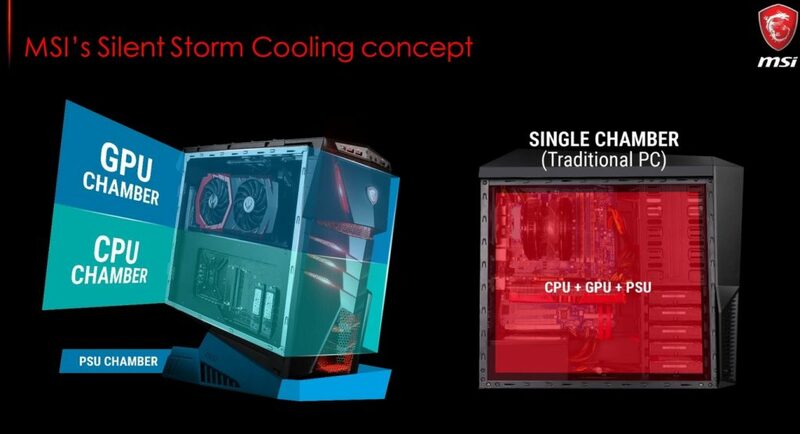 To cool the heat generated by the most ambitious solutions, MSI has SilenStorm cooling, which divides the PC into three cameras : one for the power supply (located at the bottom), one for the CPU and one for the GPU. That not only allows a remarkable ventilation for all the components and the different sections in which MSI divides these PCs, but also a simple access to the components. The MSI Gaming Center application also allows you to customize the LED lighting of these MSI boxes. Continue Reading: WiFi Mesh Networks: What they are? How they work? Why they can improve your WiFi network at home? 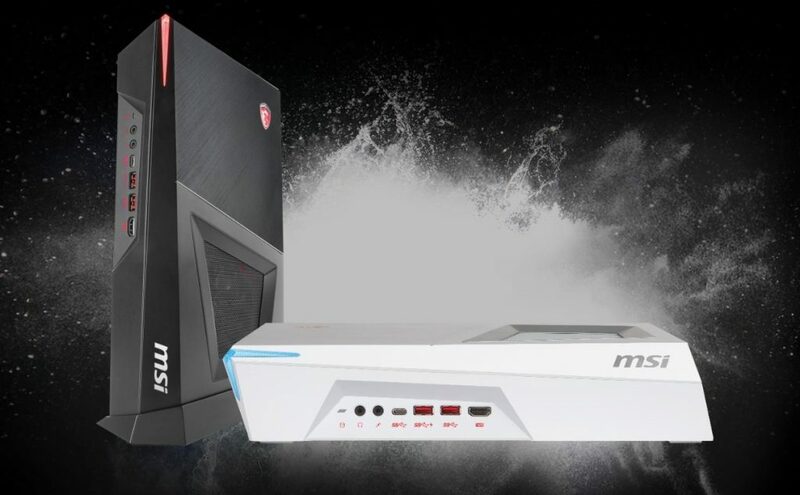 If our gaming needs are somewhat more modest or we value space above all else, MSI has two different product families. The first and most notable for its ultracompact designs is the Trident family, which allows us to access configurations with up to the Core i7-8700 and even a GTX 1070. Prices here range from 1299 to 2299 dollars depending on configuration. The second alternative, less compact, is offered by the NightBlade Mi3, which have an Intel Core i5-8400 CPU and a GPU that can be the GTX 1050 Ti or a GTX 1060. Prices range from 1099 to 1499 dollars. In MSI one of the leading families is the Aegis, oriented to ‘LAN parties’. The Aegis Ti3 are the most ambitious equipment and have an Intel Core i7-8700K CPU and graphics ranging from the GTX 1070 to the GTX 1080 Ti. The storage system achieves MSI yields of up to 7200 MB / s thanks to the RAID configurations used in some models of this series, but that, of course, has a price: these computers have prices ranging from 2299 to 4999 dollars. 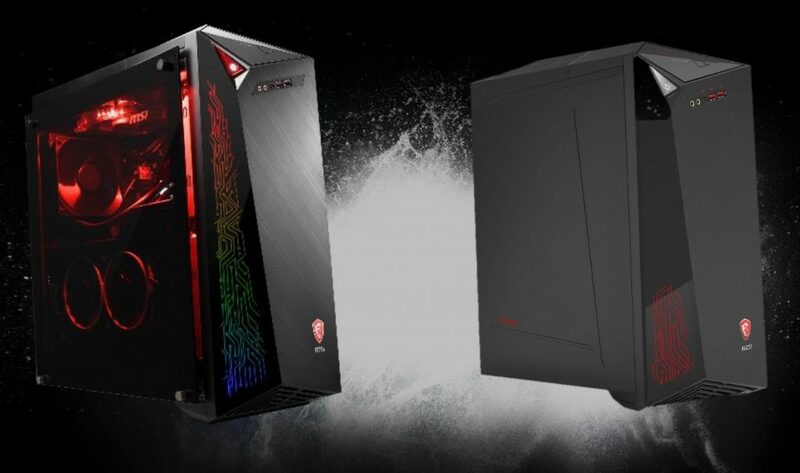 The Aegis 3, somewhat more modest, have Core i5-8400 or Core i7-8700 CPUs, NVIDIA GeForce GTX 1060 or 1070 graphics and prices ranging from 1199 to 1899 dollars depending on configuration. This year at MSI they have wanted to create another family with somewhat less ambitious teams to the Aegis family. They are those that belong to the Infinite series and are aimed at those who want to get fully into the field of eSports. In this family we have three variants with different chipsets. The Infinite X is based on the Intel Z370 which differs from the rest in that it gives access to overclocking with the Game Boost system, in addition to having a liquid cooling solution. Somewhat less ambitious are the Infinite A (Intel B360) and the Infinite (H310), whose power supply is 350W instead of the 550W of the other two models. These configurations therefore also vary significantly in price. For 999 dollars we can access the Infinite based on the Core i5 and a GTX 1050, and if we want more options we have the Infinite A with a Core i7-8700, a GTX 1070 / Ti and prices that are 1899 or 1999 dollars. The most demanding may opt for the Intel X family, which allows access to Intel Core i7-8700 or i7-8700K CPUs, graphics ranging from GTX 1060 to GTX 1080 and prices ranging from 1599 to 2199 dollars.